Shanti Devi is believed to be India's first and only female mechanic. 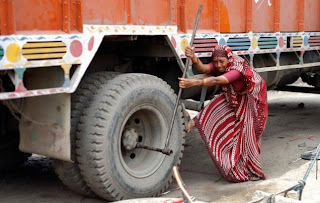 The 50 year old employs her 55 year old husband, Ram Bahadur, on the Sanjay Gandhi Transport Nagar Depot, on the outskirts of Delhi. Her garage sits on a 75 acre site and has been functioning for 18 years. Working 12 hours a day, seven days a week, Devi makes 48,000 rupees (£650) a month in the heyday summer months, where some pull in 2,000 rupees (£26).